I'm sad. 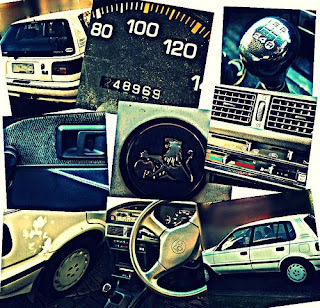 Today I farewelled my rusty trusty steed. This was my first-ever car. With two decades and 248,969 km behind it, my little white hatchback had long exceeded its life expectancy. I've been told that it is being "sent to auction". I think the car dealer might have meant auction in the sense of having its guts ripped out and being squashed like an ant. Oh sad, sad day. i empathise. Oh! It's just like my car, only manual. Well, and the badging. I will have a little cry when he goes to the great auction house in the sky too. Oh my... What will Mr Hoppo Bumpo say when he finds, not only a 'new' quilted throw, but also a space where the car should be.??? Oh no! I tend to get attached to our cars too so it's hard when we get new ones. Unfortunately I think mine (same model, as we discussed) is going out in sympathy. Even more unfortunate is that it's our "good" car. Oh - there's just nothing like your first car! Here's a strange thing: I would have sworn I had followed your blog, but then I began to notice you missing from my blog reader! Yikes! Fixed now.